1. A high cut, low back swimsuit available in a bunch of different phrases (and colors). Mermaid? Check. Bride-to-be? Check. Island vibes? Check check check. Me and my best friend purchased this suit (I got the blue "mermaid" one/she got the pink "rosé all day" one) and IT IS AWESOME. The quality is great and the fit is perfect. BUT! I do suggest ordering one size up. Get it from Amazon for $19.99+ (available in sizes S-XXL and in 25 colors/phrases). 2. A cutout one-piece known for its starring role on Full House. Its most iconic line? "Cut it OUT!" Get it from Aerie for $32.97 (originally $54.95, available in sizes XS-XXL and in regular and long lengths). 3. A scoopneck swimsuit that's available in Baywatch red. Now excuse me as I run towards the water in slow motion. Get it from Amazon for $23.55+ (available in sizes S-XL and in six colors). Get it from Amazon for $26.99 (available in sizes S-XXL and in 19 colors). 5. A walnut-colored, stretch-knit swimsuit that will give you 🎶 hungry eyes 🎶. Walnuts. Who knew they could be so delicious? 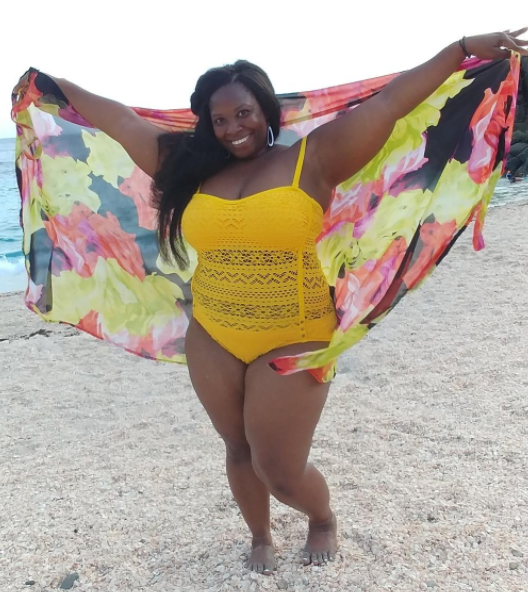 Promising review: "This swimsuit is amazing! 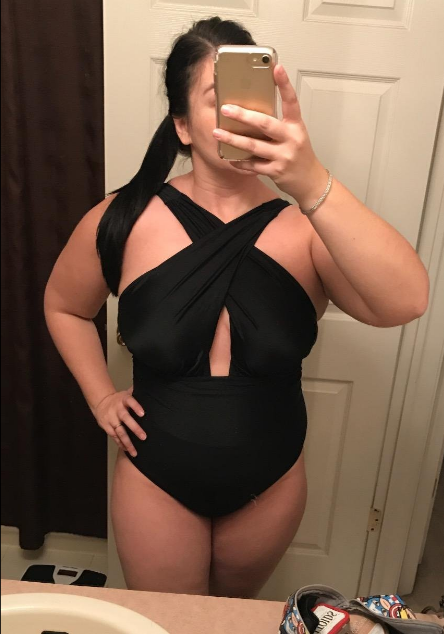 I ordered a size up (because I always find that the monokinis run short in the torso) and it fits like a glove. Makes the girls look great, too! This is a summer must-have." —Brittni F.
Get it from Asos for $12.50 (originally $32, available in sizes 0-14). 7. A vintage-inspired suit specifically designed for anyone who thinks they were born in the wrong era. 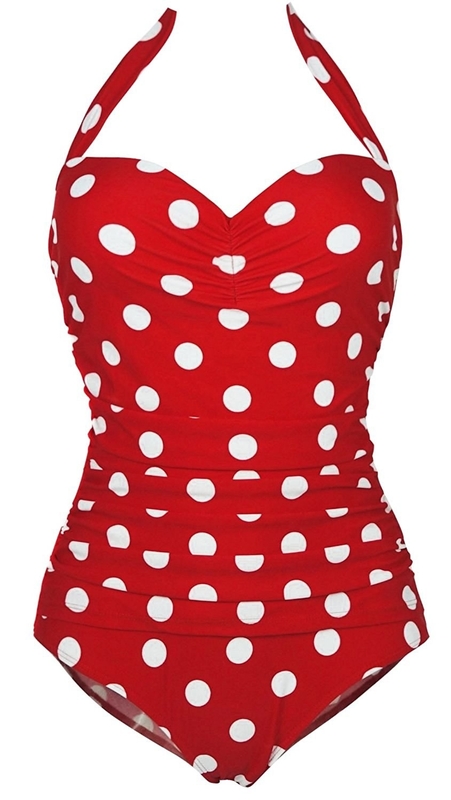 This looks like something Betty Boop would wear to the beach, am I right?! Get it from Amazon for $22.99 (available in sizes 4-18 and in 10 colors). 8. A contoured balconette suit sure to have all your admirers singing "Lady in Red". I know it's awkward, but get used to it. Get your first set from AdoreMe for $24.95 (originally $59.95, available in sizes 38DDD-46DDD and 0X-3X and in two colors). 9. A striped suit known to influence spontaneity. Like booking last-minute tropical vacations, for example. "I barely even go out anymore..." —me trying to explain my actions to my credit card. Get it from Amazon for $18.99 (available in sizes XS-XL and in three colors). 10. An embroidered monokini that is allegedly the inspiration behind the song "Take My Breath Away." Just a rumor, though! Get it from Tobi for $53 (originally $106, available in sizes XS-L and in two colors). 11. A halter V-neck suit with gorgeous hints of lace. Will this make you drool? It is very, very possible. Get it from Amazon for $18.39+ (available in sizes S-2X and in three patterns). 12. A yellow floral swimsuit representative of all the sunshine your body will finally be in contact with! GOODBYE, WINTER. Psst, this pretty little number has adjustable straps! Get it from H&M for $34.99 (available in sizes 2-12). 13. 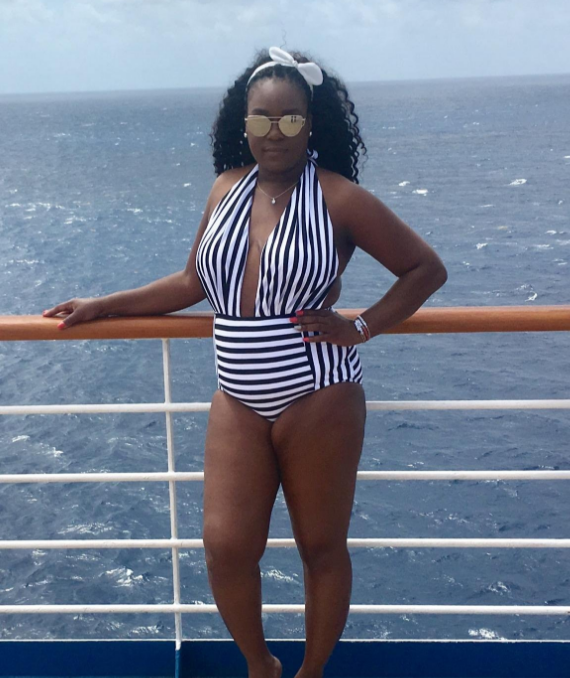 A striped one-piece so gorgeous, I'm surprised it doesn't have a modeling contract and 558K followers on Instagram. Get it from Free People for $88 (available in sizes XS-XL and in three colors). 14. A tie-back suit you can easily wear from beach to boardwalk. Just add some shorts, some sunnies, and you are STYLIN'. Get it from Aerie for $26.97 (originally $44.95, available in sizes XS-XXL, in regular and long lengths, and in four colors). 15. A scoop neck swimsuit sure to have you clicking "add to cart* immediately. You'll just want to scoop it right up. Get it from Asos for $35 (available in sizes 0-14 and 12-20). 16. A cheeky, reversible palm tree suit that epitomizes every Instagram picture of Miami ever. We get it, they have palm trees. Am I bitter because I'm in need of a Miami vacation? Yes. Get it from Amazon for $17.99+ (available in sizes S-XL and in six patterns). 17. An asymmetrical one-piece guaranteed to become your go-to LBS: Little Black Swimsuit. Get it from Torrid for $108.90 (available in sizes 00-6 in Torrid sizing). 18. A tie-front one-piece available in four fun and unique prints. Will you want them all? Absolutely. Get it from Urban Outfitters for $69 (available in sizes S-XL and in four colors). 19. A unique swimsuit with a shell-inspired top that is the hottest thing in mermaid fashion. Ariel was actually spotted wearing this suit recently. You know, while taking a stroll with Prince Eric. Get it from Amazon for $19.99+ (available in sizes S-XXL and in three colors). 20. 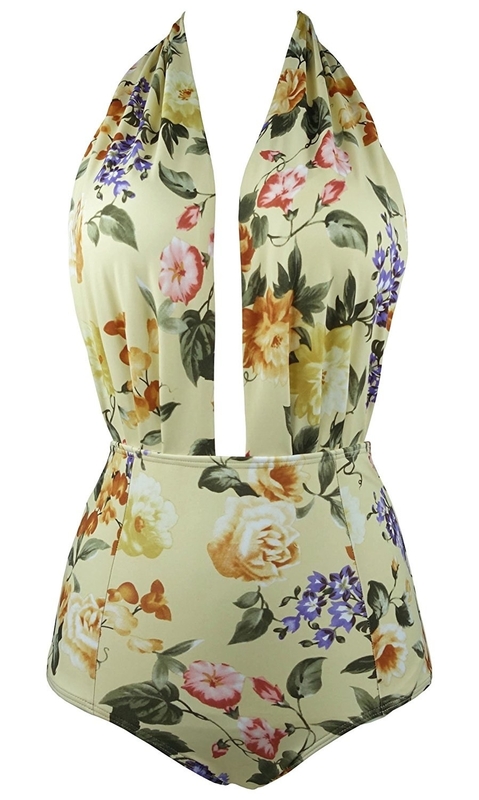 A floral swimsuit made with adjustable straps AKA this pretty little number will feel like it is tailored to you. Get it from H&M for $34.99 (available in sizes 12-24). 21. A crocheted swimsuit to make everyone think you're a DIY expert. Just say you designed this bad boy yourself. They will totally believe you! Promising review: "I never write Amazon reviews, but I had to write one here; I love this swimsuit! This is cute, flattering, and great quality for a really low price!" —Alex L.
Get it from Amazon for $25.99+ (available in sizes 0-16 and in 15 colors). 22. A scooped back swimsuit for anyone who wishes they were longing on a boat in St. Tropez, champagne in hand. One day, folks. Get it from & Other Stories for $55 (available in sizes 4-12). Get it from Walmart for $19.96 (available in sizes S-XL and sizes 1X-3X). 24. A gorgeous one-piece that is actually two swimsuits in one! The reverse side is plain black, meaning you can wear it as a bodysuit with some jeans all year long. 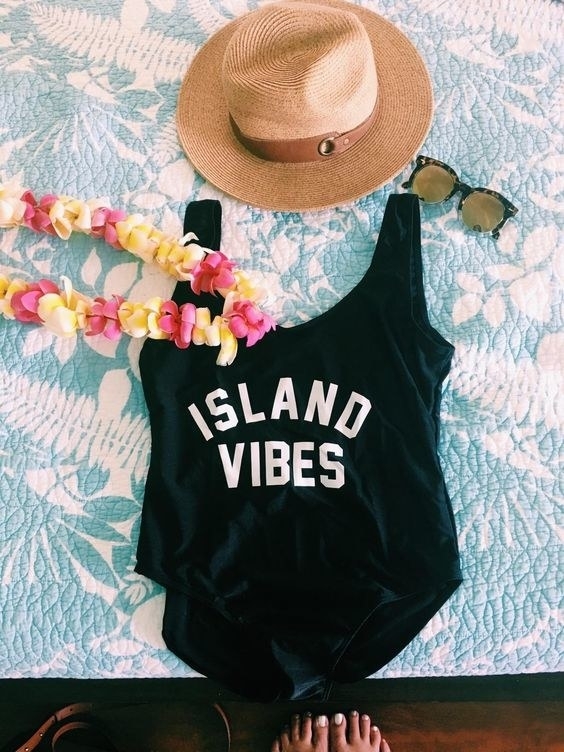 Get it from Kulani Kinis for $69 (available in sizes XS-XL). 25. A mesh swimsuit available in a bunch of gorgeous, vibrant colors. Now if you'll excuse me, I need to go purchase all of them. Get it from Amazon for $9.99+ (available in sizes S-XXXL and in eight colors). 26. A cutout swimsuit you'll want to pack for your next vacay. Haven't booked one yet? WELL WHAT THE HECK ARE YA WAITING FOR? "A savings account..." —me, giggling nervously. Get it from Forever 21 for $24.90 (available in sizes S-XL). 27. A swimsuit that can be worn two ways. You can pack this baby in your carry-on and BAM! You'll be good to go for your weekend trip. Get it from Amazon for $21.48+ (available in sizes S-XXL). 28. A halter swimsuit representative of the two best Starburst flavors: PINK AND RED, folks. Get it from Nasty Gal for $30 (originally $50, available in sizes 4-10). 29. A palm print swimsuit so beautiful, it'll have you eating out of the ~palm~ of its hand. I am so sorry for my puns. They've gotten out of hand, I know. Get it from Albion Fit for $128 (available in sizes XXS-XL). 30. A plunge one-piece in a solid navy color you'll want to wear again and again. And again and again. And again, probably. Get it from Lively for $65 (available in sizes XS-XL). 31. A ruffled one-piece voted "Most Likely to Become Barbie" in its high school yearbook. Get it from Walmart for $19.96 (available in sizes S-XL). Want even more swimsuits? 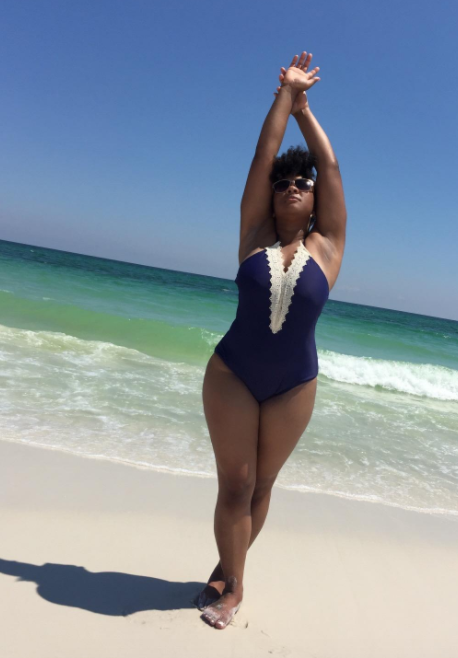 Check out our favorite places to buy the best bathing suits the internet has to offer.